The Supplemental Nutrition Assistance Program helps low income individuals and families buy healthy, nutritious food. Funded by the federal government and administered by the state’s Department of Transitional Assistance, monthly benefits depend upon household size, income and expenses. 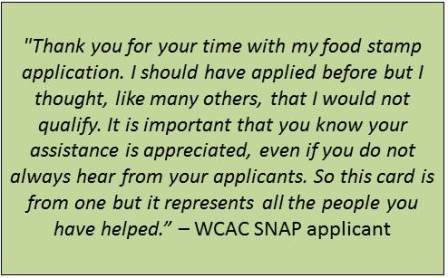 In collaboration with the Massachusetts DTA, the Worcester Community Action Council accepts applications for SNAP at its Worcester office, 484 Main Street, 2nd floor, Worcester. Benefit Summary – Check you case status, monthly benefit amount, next benefit issue date, EBT balance, recertification due date and more. there is a 24-hour delay on EBT balance. Alerts – Get updates about your benefits, including upcoming appointments and workshops and documents you need to file. Notices – Get general information about your case. Documents – Find out if documents you’ve sent to DTA have been processed. Contact Information – Find local contact information for DTA and update your own account information. Worcester, Auburn, Boylston, Cherry Valley, Gilbertville, Hardwick, Holden, Jefferson, Leicester, Millbury, New Braintree, Oakham, Paxton, Rochdale, Rutland, Shrewsbury, West Boylston, and Wheelwright.